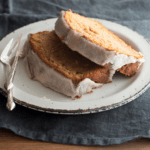 Sweet Potato Pound Cake Recipe – Million dollar pound cake made with silky smooth sweet potatoes and topped with a spiced brown butter glaze. Sweet potato dessert to the max! Sweet potatoes were an extremely important food throughout my childhood. My mom made sweet potato pie for every Thanksgiving, and now that I’m an adult, I have fallen in love with the super tasty spud. I eat a baked sweet potato for dessert on a regular, especially during the fall months. So, I’m no stranger to sweet potato dessert. 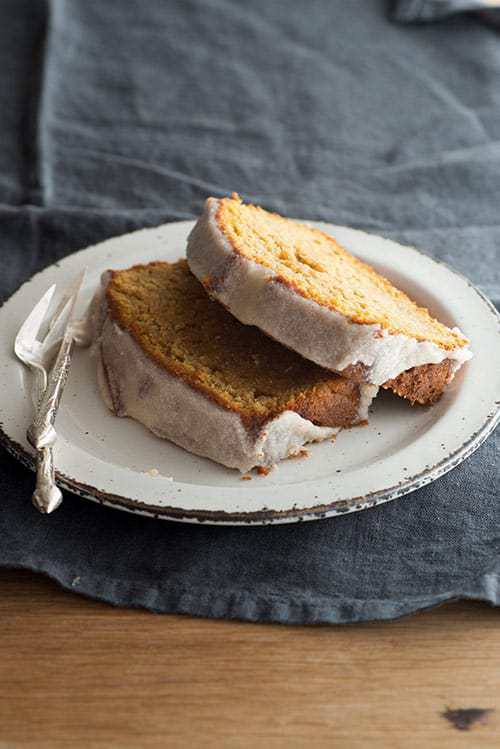 This Sweet Potato Pound Cake recipe comes from my love of eating sweet potatoes as a dessert. I didn’t grow up with a sweet potato pound cake recipe, but this recipe is inspired by all the Southern desserts I was raised on (Sweet Potato Pie, Caramel Cake, 7 Up Pound Cake, Yellow Cake with Chocolate Frosting). I developed this sweet potato pound cake recipe using the pound cake recipes I grew up on (Cream Cheese Pound Cake and Million Dollar Pound Cake) and created something new but still a quintessential Southern dessert; one of the best Southern desserts I’ve ever made! 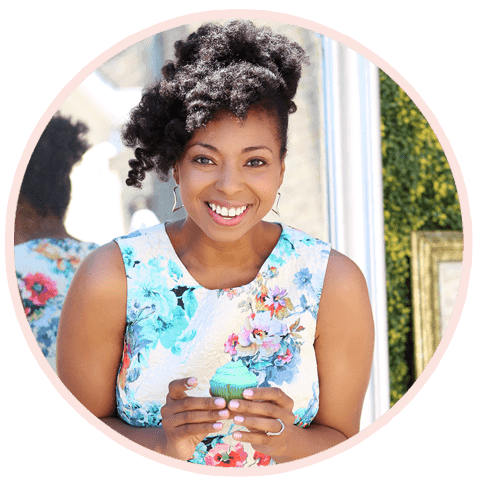 I am beyond honored to be featured on Design Sponge in their “In The Kitchen With..” series this week. There are a few iconic websites that I adore and have adored for years. Design Sponge is definitely one of them so this is a very cool moment indeed. Because pound cake was the first recipe I ever learned to bake, this sweet potato pound cake recipe is quite a special one for me. It brings together my fondness of pound cake and also my love and history with sweet potatoes, which were such a big part of my upbringing. You can find the full Sweet Potato Pound Cake recipe and the gorgeous images of my pound cake by Kristina Gill HERE. Thank you once again Design Sponge. I can’t wait to share again! Sweet Potato Pound Cake Recipe - Million dollar pound cake made with silky smooth sweet potatoes and topped with a spiced brown butter glaze. Sweet potato dessert to the max! To the bowl of your mixer, add butter, both sugars and sweet potato. Cream ingredients on high until fluffy and smooth, about 4-5 minutes. Add eggs one at a time into the mixture. Next turn mixer speed to slow and slowly add in cake flour, baking powder, baking soda, salt, ground cinnamon and nutmeg, beating after each addition. Lastly, add in vanilla extract and beat on slow speed until mixture is smooth. Spray loaf pan with non-stick baking spray and pour cake batter into pan. Begin checking the cake to see if it is done after 35 minutes. Bake for 35-50 minutes, some ovens may take longer. The cake is done when a toothpick or cake tester inserted in the center of the cake comes out clean. Remove cake from oven and allow it to cool for 10 minutes in the pan. After ten minutes, gently remove cake from its pan and place it on a wire rack to cool completely. For the glaze, add butter to a small saucepan and carefully melt over medium low heat on your stovetop. Continue to watch until the butter turns a golden brown color and the smell is sort of nutty. Once butter gets to this point, quickly remove and whisk in powdered sugar, vanilla extract, ground cinnamon and milk until mixture is smooth and pourable. 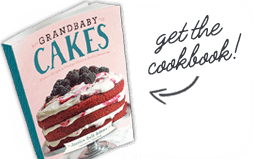 Drizzle glaze over completely cooled cake and serve. How do you roast your sweet potato for this recipe? My girlfriend and I have differing ideas of how to start this recipe! I actually add it to an oven and bake it for about an hour. Making sure to oil it, pierce it and then cover it in foil. I never would have thought of using sweet potato in cakes! This pound cake looks so delicious – moist, fluffy and I love how easy it is to make. I didn’t see liquid in this recipe. Is that correct. Wow. I have never seen ANYTHING like this! And I want it, like…now! 🙂 Congrats on the D.S. feature!!! Thank you so much Averie!! You are all kinds of awesome, lady!! CONGRATS on the feature!! I looooove Design Sponge! I hope you enjoy Baby June! Woohoo! 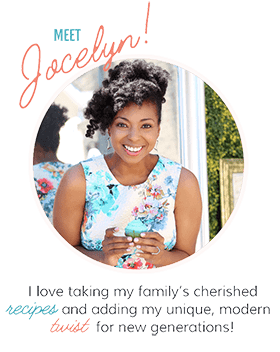 Congrats, Jocelyn! This pound cake looks phenomenal! 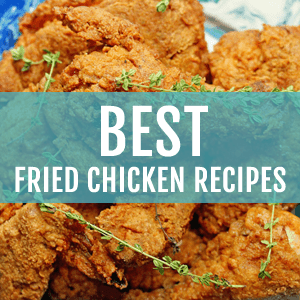 With a spiced brown butter glaze? Oh yes! Congrats Jocelyn! 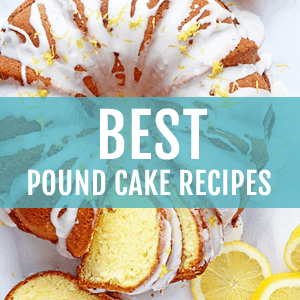 Will go and click over – this pound cake looks delicious. I pretty much have no words. This is gorgeous! And it sounds beyond delicious! Thank you so much my dear! Love ya lots! Congratulations! This pound cake looks divine. Sweet potato just brings it to a new level.